This weeks’ demonstration in the village of Al-Maasara was attended by approximately forty peaceful protesters with twenty Palestinians and twenty internationals. As always during the protests in Al Ma’asara the protesters were confronted by a line of Israeli soldiers who refused to allow the Palestinians cross an Israeli built road. The significance of this road is that it passes directly through the village and connects several illegal settlements together, which surrounds Al-Maasara. 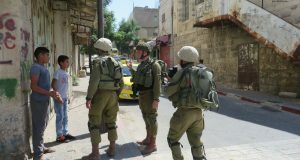 Thus in preventing the Palestinians from crossing the road, the soldiers refused to allow the Palestinians to reach their land. The demonstrators, who were double the amount of the soldiers, showed considerable restraint in the face of Israeli soldiers’ provocation and aggression. Throughout the demonstration, which lasted approximately forty-five minutes, there were a number of passionate speeches by members of the community, both to their supporters, but also significantly to the Israeli soldiers. 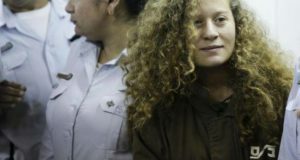 In an admirable attempt to illustrate to the soldiers the inalienable rights of the Palestinian people, they opposed the unjust and often brutal way these rights are being denied by the Israeli government. Unfortunately, there was no obvious indication that the soldiers allowed themselves to be influenced by these words of truth and peace. At one point during the demonstration a Palestinian man, Hassan Beigier, was permitted to pass through the line of soldiers. At the time it seemed the soldiers had claimed they would recognize Hassan’s right to reach his land. 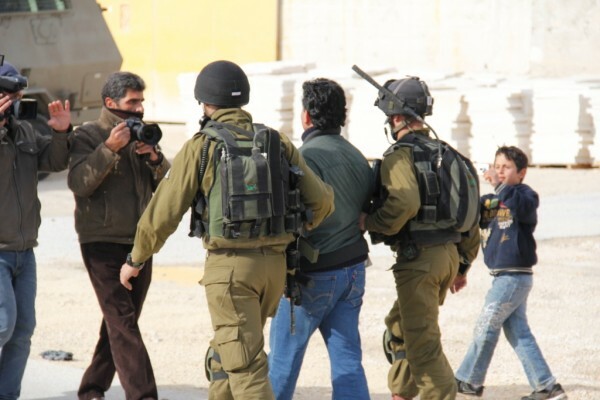 However once again, the Israeli army used the well practiced strategy of deceit, and as soon as Hassan was separated from the crowd he was arrested and escorted into a military van. 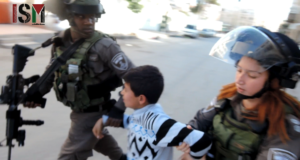 After the demonstration ended a fourteen year old boy, Ibrahim Alfuagra, was also arrested, under false charges of throwing stones during a peaceful demonstration in which the only elements of violence or aggression were perpetrated by Israeli soldiers. On Sunday the 11th of December 2012, both Hassan Beigier (accused of assaulting a soldier) and Ibrahim Alfuagra will face the, “justice” of the Israeli military court for charges everyone present at the demonstration knows are false.